“Spider-Man: Homecoming” is one of the precious few Marvel Cinematic Universe films that uses its franchise to its advantage without feeling like a mechanical series installment programmed to do little other than set up more sequels. Perhaps the most impressive differentiation from prior MCU films is that “Spider-Man: Homecoming” offers the franchise’s first memorable villain since Loki’s debut over six years ago. Michael Keaton’s Vulture steals every scene he’s in and the character’s personality and motivations are consistently human, and his performance should keep viewers’ eyes peeled just to find out what happens to the character next. Though Keaton kills the part, it’s a shame that he’s not given just a bit more screen time, which begs the question of what a more villain-focused MCU film could be like. Of course, this is a Spider-Man film, and Tom Holland’s Peter Parker is the focus here. Thankfully, Holland’s performance in last year’s “Captain America: Civil War” was no fluke, and his character’s laugh-out-loud goofiness is a breath of fresh air for the franchise. The jokes come fast and hit far more than they miss, and though they aren’t as consistently hilarious as Spidey’s bits in “Civil War,” they come reasonably close for a feature-length performance. On the topic of other MCU films, prospective viewers shouldn’t worry about Robert Downey Jr.’s extended trailer appearances. This is a Spider-Man film first and foremost, and when other characters in the franchise appear or are referenced, it’s organic and sometimes genuinely hilarious. 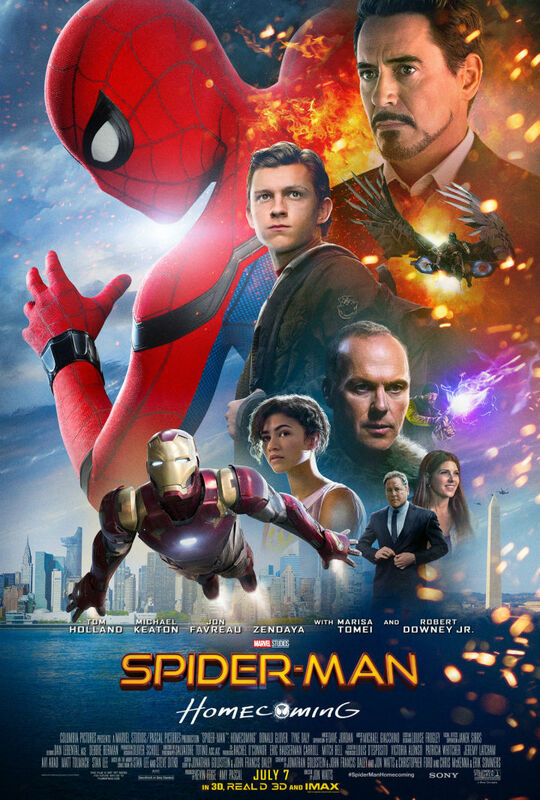 It’s also nice to see “Spider-Man: Homecoming” buck the stereotypical origin story arc: While this is Parker’s first solo outing, little time is wasted on spider bites, Uncle Ben-ing and other tropes that have been done several times over in the last decade of Spider-Man films. Laughs are abound whether Parker is suiting up as Spider-Man or mulling around high school, which is good, since the film’s action is little more than superhero white noise. The choreography, cinematography and special effects — laser orgies and other action cliché nonsense are mostly toned down, thankfully — are serviceable, but none of the fight sequences do much to stand out. It’s particularly unfortunate that this extends to most of Spidey’s encounters with Vulture, and their climatic showdown is pretty much anything but. There’s also concerns to be had with character depth. Other than Keaton’s Vulture, there’s little in the way of character development, which makes some of the interactions later in the film border on incredulity. Despite the lack of growth, it’s hard not to like most of the cast, who all bring enough humor and heart to the film to avoid coming off as stock characters. It’s that kind of witty warmth that elevates “Spider-Man: Homecoming” above many of its superpowered contemporaries, despite the lukewarm battle scenes and lack of nuance. There’s plenty here for Marvel fans to love, and for those that have been tuning out to the ever-expanding Marvel machine, this is a good argument to bring you back into the fold.